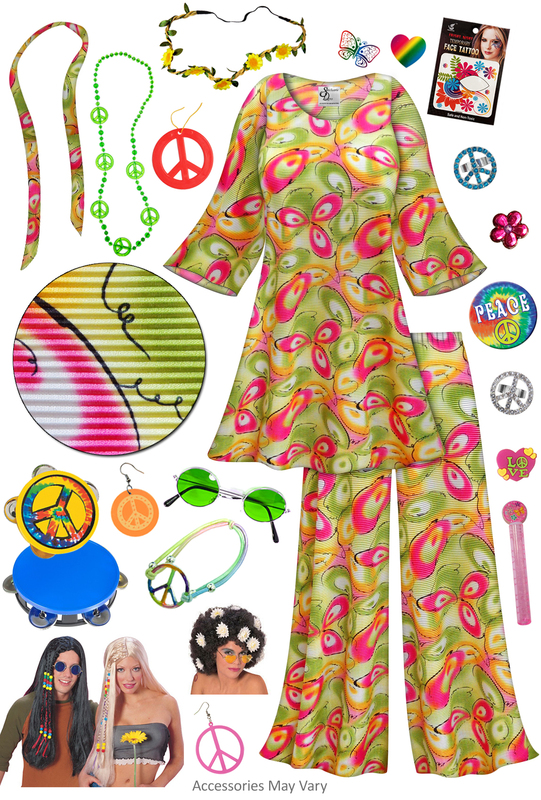 Want to be a Plus Size Hippie this Halloween? This is a fabulous print that's sure to make you the star of the show. The fabric is a bright & vibrant lightweight stretchy slinky fabric that has a wonderful drape. You can choose to order this top & pant 2 piece set in various lengths with our Basic Kit or UPGRADE to our Deluxe hippie costume accessory kit! Accessory colors & style may vary from picture. Add a hippie wig or a mini-tambourine for just a little more! Appx Pant Inseams: Petite:26"/27" - Standard:29"/30" - Tall:33"/34"
Appx Shirt Lengths: Petite:32" - Standard: 35" - Tall - 37"